US consumer spending on pet health products and services will reach $30.9 billion in 2016, driven by the increasing treatment of companion animals as family members. Pet insurance will continue to see the fastest gains in the dominant service segment. Pharmaceuticals and parasiticides will remain the largest product segments. 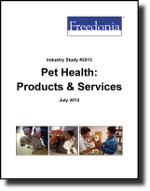 This study analyzes the $24.6 billion US pet health industry. It presents historical demand data for the years 2001, 2006 and 2011, and forecasts for 2016 and 2021 by service (e.g., veterinary care, non-veterinary pet care, pet insurance), product (e.g., pharmaceuticals, parasiticides, prescription food, dietary supplements, vaccines, diagnostics), condition (e.g., skin, heart, gastrointestinal, renal, arthritis) and animal (e.g., dogs, cats, birds, small animals). The study also considers market environment factors, details industry structure, evaluates company market share and profiles 27 industry players, including Pfizer, Merial and Bayer.